In 1932, L.J. Skaggs opened Payless Drug Stores in Tacoma, Washington, which soon expanded across the western United States. Some stores were sold to his brother Samuel “”L.S.”” Olnie Skaggs (then an executive at Safeway) along with some colleagues. L.J. Skaggs retained California Pay Less Stores, which became part of Thrifty PayLess, and which are now owned by Rite Aid. 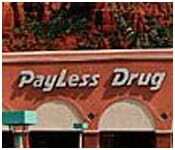 The remaining Pay-Less stores were renamed Skaggs Drug Stores in 1948, Skaggs Drug Centers in 1965. In 1969 Albertsons supermarkets and Skaggs Drugs partnered to create combination food and drug stores, a partnership that dissolved in 1977, with assets divided.